All hail King Colin! Massive congratulations to him and The King’s Speech team for a right royal clean-up at the 83rd Annual Academy Awards. And well done to Natalie too, a) for a more than deserving win for her incredible performance, and b) for looking a million times more elegant than most non-pregnant women. Although I haven’t seen the whole ceremony, I get the impression that Anne Hathaway never strayed far from shrill during her debut as host, and that James Franco appeared half asleep. Better stick to SNL in the future, guys. Natalie Portman – I had a feeling she was going to pull something special out the bag. And knowing that you’re pretty much a shoe-in for one of the night’s big awards means you must pick a show-stopper, because that photo is going to be around forever. It’s got to be timeless, but also have an edge so as not to be boring. Bingo! Also, nice tie-in wearing Rodarte after they designed the fabulous Black Swan costumes. Sandra Bullock – Yes! Love it. Fits her to perfection (someone’s evidently been off the carbs since the New Year) and an overall feel of Old Hollywood. I’m extra happy when Sandy B gets it right, because she’s one of my absolute favourites and in another life I’m positive we’d be best friends. Mila Kunis – Mila + Elie was always going to work for me. It was an inspired choice for her. On someone else it might have had a touch of your grandmother’s net curtains, but on this lady it’s a winner. I’m going to stop now, because too much gushing is tacky. Halle Berry – This picture makes me want to drop what I’m doing, hot-foot it to the gym and stay there until I look like this. Berry has made some dubious red carpet choices lately (*cough* Golden Globes), but she’s back on top with this one. Marchesa is one of my favourite designers, mostly because of their penchant for a ruffle, and the colour and fit is spot on here. Can’t stop looking at it. Michelle Williams – Thank Chanel for that! I thought she’d struggle to recover from the Valentino gaffe at the Golden Globes, but she looks exquisite here. It works perfectly with her delicate skin-tone and elfin hair. Welcome back! Reese Witherspoon – I grappled with this one. I wanted to heart it, because I heart her… but it’s just a safe dress, an ok hair-do and cute earrings (albeit a tad Angelina from last year). But it’s a long way off the wow factor of 2007. Although that one did need to be a corker to drive home the “in your face, Phillippe” message. Cate Blanchett – My head’s screaming, “hate it, it looks ridiculous” , but there’s another voice telling me that it sort of works on her. It may look like something that Lt. Uhura might wear to the Starship Enterprise Summer Ball, but I can’t bring myself to completely slate it. I think it’s the pleats. I do like a good pleat. Amy Adams – I actually said “meh” in my head when I saw this. I kind of see where she’s going with it, but it looks too fussy with the jewellery on top. Love the loose waves and healthy glow, but Adams has the potential to look a million dollars (literally), so this choice falls a little flat with me. It would have worked better at an office Christmas party and she was trying to pull Dave from Accounts. Hailee Steinfeld – Turning up looking like an extra from Black Swan is not going to improve her chances of taking home a prize. By the way, this is blatantly jealousy talking that she gets a custom-made Marchesa gown and she’s about 11. Gwyneth Paltrow – Gwynnie, your hair looks amazing, and well, that’s it. You look a bit like Daryl Hannah’s body double in Splash. I know you’re no Sofia Vergara in the curvy stakes (and that’s largely down to genetics… and doing yoga in your sleep), but this isn’t the best choice for your body type. I see this and all I want to do is introduce you to something called a Mr. Kipling Cherry Bakewell. 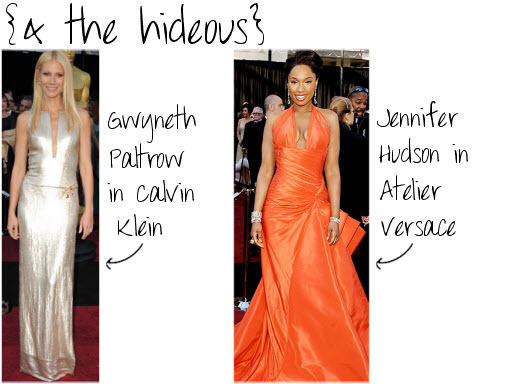 Jennifer Hudson – Just because orange is the shade du jour, doesn’t mean you find a shiny, badly-fitted version of it and wear it to the Oscars. This really wasn’t the best time to get it spectacularly wrong. Or expose a two-tone chest. I say this with love, because I know she can do better. Penelope Cruz – You know what this reminds me of? An item from one of those solitary shops on the high street (called something ironic and misspelt, like ‘Klass’) that sell cheap prom dresses. The ones that are always deserted, smell a bit funny and you only went into because you wanted a plain tank top for 2 quid. And you quickly leave because you fear for your life. Yep… that’s it. Nicole Kidman – Seriously, Nicole, this dress? It looks like an expertly-folded napkin with some festive glitter sprinkled on top… and that she took a pre-Oscars nap, woke up late and shoved her hair up because she didn’t have time to wash it. These people have stylists, right? Or a mirror would have been a start. Anne Hathaway – I’m at a loss for words. Actually, I’m not. She is selected as the event’s co-host (why they didn’t pick Bullock is beyond me) and she opts for this number? It looks like the kind of thing your friend has asked you to wear as her bridesmaid, “because it’s a winter wedding and everyone does red” , and you haven’t got the heart to tell her you hate it, so instead suffer through the barrage of photographs and people telling you that you look lovely even though you know for a fact that you look like a badly-wrapped Christmas present with a load of excess paper bunched up at the back with sellotape. Which I’m guessing is not the look she was going for. Scarlett Johansson – Scar-jo, if you wore this to show Ryan what he’s missing, then you wore the wrong dress. You would have done better coming in one of the Mango frocks you’ve been modelling so beautifully. And not scrubbing off the stamp from the club you went to last night? Leave that to Paris Hilton. Hilary Swank – I know you weren’t up for an award, but please revert to the ‘Hailee Steinfeld’ memo. So, tell me dear readers, what do you think? Feel free to contradict everything I’ve just said… I’d love to hear your thoughts! I watched some of the oscars and penelope dress was actually stunning (I thought) it does not come over well as a flat photo and Michelle williams I thought was a bit too mumsyshe is young and could have had something more fun. I thought Helena Bonham Carter looked great and was very sedate for her. Well, this has lifted me somewhat. As a dedicated Oscar follower for a number of years, I felt the ceremony was wholly flat – the Franco-Hathaway combination being one of the worst Hollywood experiments since Sophia Coppolla’s flirt with acting in The Godfather Three. However, I was intrigued, that WYF did not comment on those hideous glasses that Bonham-Carter was wearing (a shoe-in to always look ridiculous) – thoughts? I also was slightly concerned about Hudson; she looked a bit thin (or maybe I’m just nostalgically recalling the curvy days of 2006 when she wore, infamously, that little silvery jacket that looked like it had lost its way from David Bowie’s wardrobe). And Swank. I’m with you. That is, well, I’m a little speechless myself at how hideous that dress is. And I’m dissappointed – Swank has a fantastic back; muscly, yet feminine, lean, yet delicate. Why on earth you wouldn’t work that into your outfit (yes yes, even if you do do it every year with a backless number), is beyond me.